In the Gong Labs series, we publish what we learn from analyzing sales conversations with AI. Subscribe here to read upcoming research. The words “list price” signal that your price is wobbly and movable. They telegraph that you have a fat margin with more than enough room to negotiate. When these words pass your lips, you’re practically begging your buyer to grind you down on price. When a sales rep says list price, typical price, or standard price to a buyer at any point in a deal, the sales cycle is 19% longer than average. If you have a 60-day sales cycle, that’s an extra 12 days tacked on. Enough to push the deal to the next quarter in many cases. I’ll quickly explain how we process data, for those of you unfamiliar with our research. This data comes from an anonymized pool of sales call recordings from our product users. We recorded more than 2,000,000 sales calls and web conferencing meetings and analyzed them using AI to isolate what works, according to data. Then the AI goes to work in real time, transcribing the recording and separating each speaker. Next, the sellers’ and buyers’ behaviors (e.g., discovery questions, customer objections, etc.) are pinpointed by algorithms, along with specific topics that were discussed throughout the call. After analyzing more than 2,000,000 sales calls and the outcomes they produced (close rates, sales cycle, etc. ), we’ve learned interesting facts about what works—and what doesn’t—in sales today. Let’s get back to our story. The 19% increase in a sales cycle’s length likely comes from the sense of uncertainty the words “list price” trigger in your buyer’s psychology. Cursed with the knowledge that your pricing is easily manipulated, they’re never quite sure when they’ve hit the lowest price possible. They’ll put off a decision and get stuck wondering if this is the best price they can get from you. In fact, this behavior is practically illustrated in the data itself. 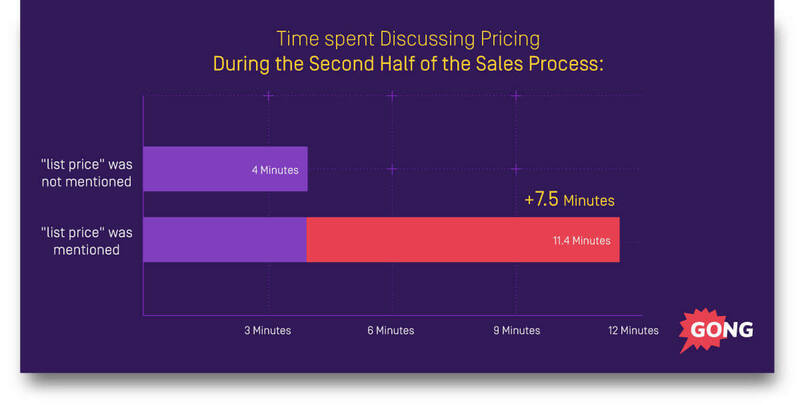 When a seller says “list price” during one of the first two sales calls in the sales process, the total duration of time spent discussing pricing later on triples. With the words “list price” forever etched in the buyer’s mind, they can’t help but continue bringing it up in the hopes that they can carve a bit more off the final price before putting pen to paper. The solution is to use words that create the perception of an unyielding, resolute price. Sure, you could just say “pricing” and leave it at that. But you can do better. Especially in today’s sales environment where buyers are conditioned to expect heavy discounts. The word “approved” implies that there is a higher power than you with pricing authority. It also suggests that pricing concessions are highly scrutinized and aren’t easily won. Unlike a seller who begs to be jerked around by saying “list price” (or any of its equally weak variations), the seller in this scenario gives her pricing an air of authority. The buyer forms the distinct impression that it will not come down easily. (By the way, it’s much more effective to deliver your pricing in the context of a bigger number or the business problem you solve, which we’ll cover in a future post). 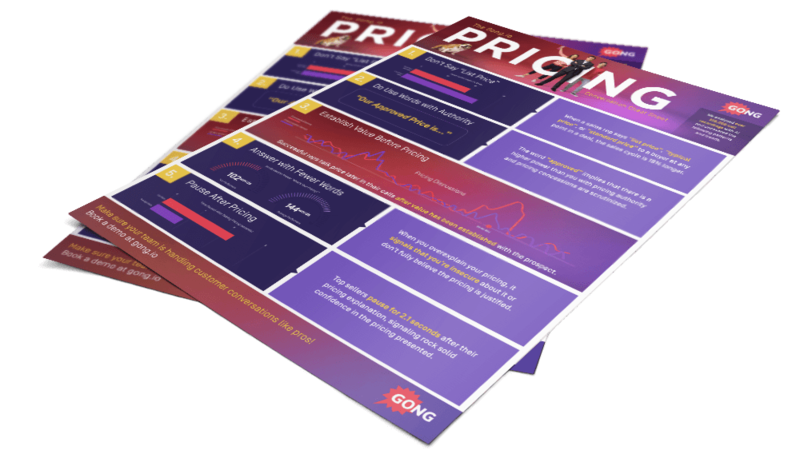 Master your pricing conversations using the right techniques. It sums up everything we’ve learned about handling fickle pricing discussions. Get your cheat sheet today.